The White House urged Iran to respect its citizen’s rights as the people of Iran are taking to the street in protect the past two days. The White House warned the world is watching. On Thursday, demonstrations in Mashhad a city in northeast Iran prompted Friday protests that spread to different cities around the country. 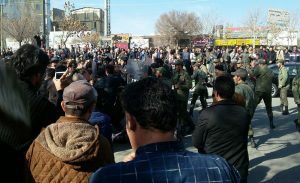 Anti-government protest were documented in Tehran, the country’s capital, Kermanshah, Qazvin, Arak, Karaj, Sabsevar and Khorramabad, according to the nation’s vice president. The protests, called the largest public outcry of discontent in almost 9 years since Iran’s Green Movement, have been prompted due to the rising gasoline and food prices. Some arrests were reported by the media in Iran. Protesters were heard on different videos that were distributed across social media chanting Death to Rouhani, in reference to Hassan Rouhani the Iran President, who earlier in the year was reelected. Some of the protesters that appear in the videos also pointed their anger at the Supreme Leader Ayatollah Khamenei. That is a rare display of public dissent and something that is not seen widely seen in the Green Movement, which is pro-reform and disputed the presidential election outcome. Poorer Iranians are involved in the latest protests in large numbers which was not seen during the Green Movement in 2009, noted an eyewitness who watched the protests in Tehran. The country is going through a difficult situation with its economy. It is rated 120th on the Ease of Doing Business Index from the World Bank and its high rate of unemployment for young people is particularly concerning for Iranians. A counter demonstration supporting Khamenei took place in Tehran on Saturday. Close to 2,000 people gathered peacefully showing their support of the policies by the government. Iranian broadcasts that are state-run showed demonstrators with the Iranian flag at the rally supporting the government. Meanwhile, the coverage of the protests against the government was limited on media that was state run, which only referenced them in passing. The Trump administration voiced its support for the anti-government rallies. On Friday, the U.S. State Department announced that it urged the world community to support the people’s demands in Iran for basic rights and no more corruption. Relations between Tehran and Washington are tense at the current time, with the Trump administration being critical of what it said was the growing regional influence of Iran and the alleged involvement in conflicts that included Syria and Yemen.